Converting website visitors into email subscribers and paying customers is the main goal of all businesses. Did you know that more than 70% of people visiting your website will probably never come back again unless you offer them a chance to subscribe. This is where a WordPress popup plugins and lead generation tools come in handy. Considering there are tons of great WordPress lead generation plugins in the market, we have decided to compare the top ones to determine which is the best WordPress popup plugin overall. There are so many WordPress popup plugins available both free and paid. The main problem with most popup plugins is that they can become very annoying for users. This has a negative impact on user experience. Another common problem with popup plugins is that they can slow down your website. Some take too much time to load while others are very resource intensive on your servers resulting in a slow page load time which negatively affects your SEO. The main purpose of using a popup plugin is to generate leads and boost your email list subscribers. Many popup plugins fail to do that properly because they don’t have the right balance of features and functionality. Last but not the least, some of these popup plugins aren’t very easy to use. Setting them up is not easy for an average WordPress user. So how do you go through hundreds of popup plugins and find the best one for your needs? Well you don’t have to. We did the research for you and below are our results for the best WordPress popup plugin. To keep things simple, we are only going to compare the 4 most popular WordPress popup plugins in the market today. We decided to try them out and run performance tests to see how each of them perform on a test website. The criteria we looked for in our comparison are: speed, ease of use, aesthetic appeal, and features. Let’s take a look at how each of those performed during our tests. Speed is an important factor to consider whenever you are adding something new to your WordPress site. A faster website not only ranks higher on search engines, but it also offers a better user experience for the visitors. This is why it is #1 priority in our comparison. 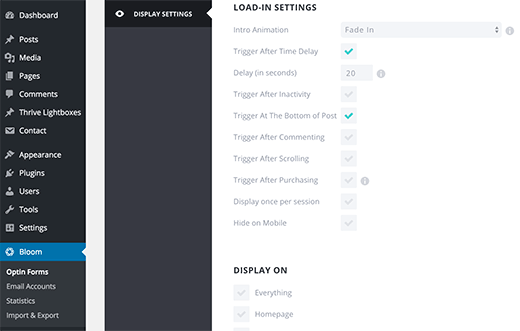 We added a default popup for each plugin with minimum customization and set them to appear on the page load. This is how they each stacked up for speed. As you can see in the test above, OptinMonster was the fastest loading WordPress popup plugin. The reason for this is because OptinMonster is highly optimized for speed. It uses the powerful Amazon cloud infrastructure to minimize your server load thus producing the best performance. You want your popup plugin to help you build your mailing list, generate leads, and convert visitors into actual customers. For that, you will need a lot more than just a shiny popup. You will need different kind of optin forms, lead generation tools, analytics, A/B testing, and more. Let’s see how our contenders stack up in terms of features. One of the features that OptinMonster became famous for was their signature Exit-Intent® technology. This means that your popup only appears when a user is about to leave your website. 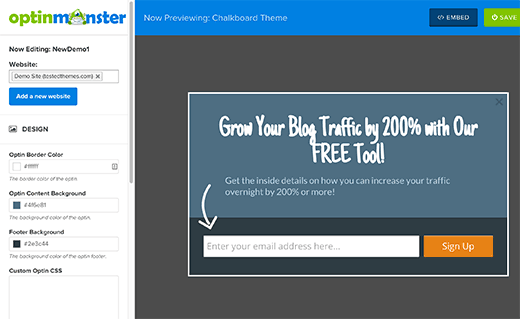 MonsterLinks is a lightbox popup that can be embedded into any ordinary link or a button. The lightbox popup appears when a user clicks on a call to action button or a link. 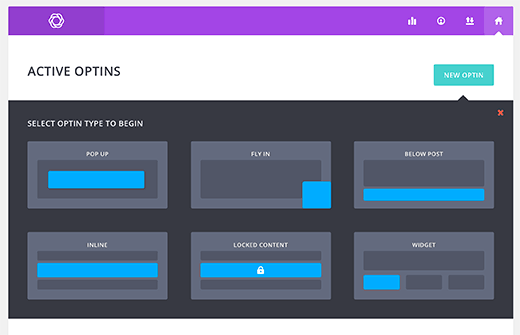 OptinMonster allows you to design your own optin forms using their visual designer. You can choose fonts, colors, add your images, and choose from multiple ready to use templates. This gives you to create very powerful, completely brandable, and stunning optin forms for your website. Apart from that you can get detailed analytics on how each of your optin is performing. OptinMonster is a certified Google Analytics partner, and it integrates directly with your Google Analytics account to provide you with the most accurate analytics. 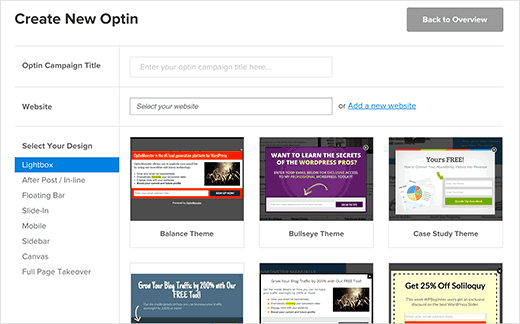 You can run A/B tests to see which optin types are bringing you the most subscribers, and use highly customized page level targeting to show custom optins based on which page the user is on. Most importantly, OptinMonster works on all websites not just WordPress sites. This is a huge advantage if you run multiple sites on different platforms or want to start a few in the future. Last but not least, OptinMonster comes with a Canvas feature which allows you to create any type of popups (not just email capture). 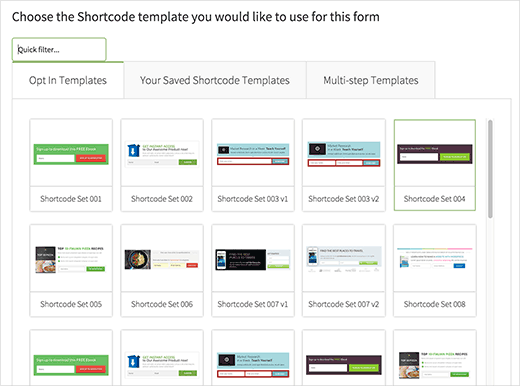 You can add custom HTML / CSS or use WordPress shortcodes. Think outside the box: related post popups, related WooCommerce popups, contact form popups, contest popups, and more. Bloom comes with multiple optin types. Bloom does not have exit-intent technology. Instead it uses the standard timed delay to display automatic popups. Now the problem is that studies have shown us that users usually decide whether they want to stay or leave a website in the very first few seconds. If your optin is set to display too late, then the user is probably already gone. If it’s set to display too early, then this will annoy the user and they will leave. Bloom does have a locked content functionality that requires users to enter their email to unlock the content which can be very effective. Bloom comes with a lot of ready to use templates that you can customize to use your own images and fonts. They do not have a visual customizer, so you can’t see the changes you make without clicking on the preview button. Just like Bloom and OptinMonster, ThriveLeads also comes with multiple optin types. Thriveleads has a lot of similar features to OptinMonster. It even has exit intent technology for popups. Just like other plugins in the list, ThriveLeads also comes with pre-built templates for optin forms. You can customize those templates in ThriveLeads on visual composer. ThriveLeads allows you to create Leadgroups and leadshotcodes, so you can create different targeting campaigns with different kind of optins. SumoMe is a free plugin with limited features, and you can upgrade to unlock additional features. The free plugin comes with a few optin types. However, the big catch is that all these optin types include prominent SumoMe branding. You will need to signup for a free SumoMe account in order to use the plugin. All your users will see a prominent blue menu bar across your site unless you pay SumoMe to remove that branding. 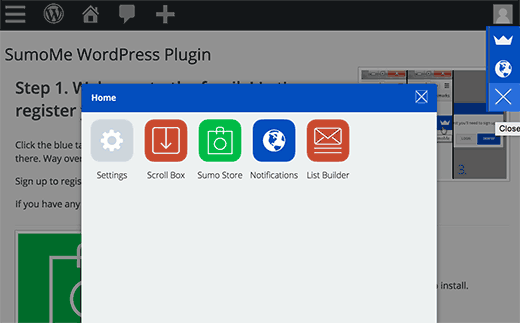 SumoMe comes with control panel where you can install add-on plugins, and setup your email optins. It offers some basic customization options to design your signup forms. Similar to OptinMonster, SumoMe can also work on all type of websites (not just WordPress). As far as the features go, OptinMonster comes out as the clear winner here. It offers the most comprehensive set of tools that you will ever need to grow your business and website. We believe that lead generation and growing your website is such a crucial thing that every site owner should be able to do that without hiring a developer. Let’s see which WordPress popup plugin is the most user friendly. Getting started with OptinMonster is very quick. You just signup for a plan, install a plugin and then you are good to go. Creating new optins is also extremely easy. Just click on New Optin button, choose your optin type and customize the design. After that, you can go to your website and select how you want to display your optin. The user interface is clutter free, and is inspired from the WordPress user-interface. Bloom is a standalone plugin. Getting started is easy because all you need to do is install the plugin and activate it. Creating new optins with Bloom is straightforward and the user interface is quite easy to figure out. The trouble comes in when you are configuring display settings. There are too many options to choose from making the UX confusing, so you will have to configure them carefully. Getting started with ThriveLeads is quite difficult even for experienced WordPress users. First of all the plugin itself is quite heavy, so if your WordPress host hasn’t increased your upload limit, then your plugin upload will fail in the middle. It is 15MB in size which is actually heavier than WordPress itself. Upon activation, you will need to provide your activation key. After that you will notice font manager, icon manager, api connections, and thrive leads menu items in your admin dashboard. 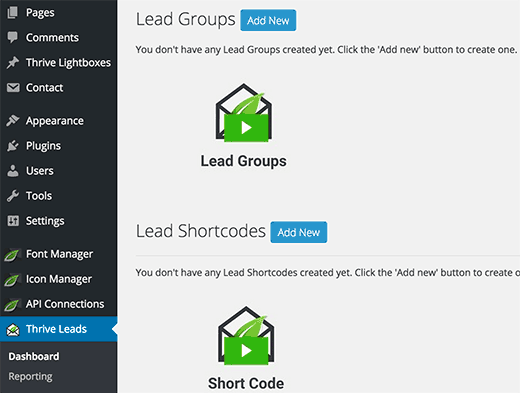 When you reach the ThriveLeads dashboard you will see leadgroups, leadshortcodes, and 2 step lightboxes. It will take you quite some time before you can actually figure out how to get to the actual optins that you wanted to add. SumoMe is a bit unconventional because they don’t have a centralized admin panel. You have to click on their badge to load the admin options in a popup. This experience alone is not intuitive. Before you could add a popup to your website, you will have to install another app from Sumo store which has free and paid apps. It will take you sometime to figure out how you would actually get to the point where you can add a popup to your site. However once you’re in their design builder, the steps are very easy and straight-forward. In terms of ease of use and beginner friendliness, OptinMonster is a clear winner. Beginner users with very little experience can quickly create and add popups and other optin forms into their website. Another decisive factor when choosing a plugin is pricing. The chart below highlights the pricing, but we will explain the pros and cons of each. OptinMonster comes with the most clear cut pricing options. You pay $49 per year if you just want the basic features, $99 per year for more advanced optins, and $199 pear year for the full suite. They also offer monthly pricing, but annual plans are on average 40% cheaper. Bloom is not a standalone plugin. It is part of a yearly membership of Elegant Themes club. So for $89 per year, you get all Elegant Themes plugins and themes which is a great bargain. The $249 is a one-time fee option. ThriveLeads offers a single site license, a multi-site license, and agency license. All the plans come with one year of support and updates. SumoMe is free, but it can become the most expensive if you purchase their $100 per month upgrade. If you use their free version, they show prominent SumoMe branding on your entire site (not very professional). There isn’t a clear winner here. If you have no budget, and you don’t mind compromising on features and displaying someone else’s branding on your site, then SumoMe is the best choice for you. If you have a small budget, want additional goodies, and don’t mind sacrificing on some features and site speed, then Bloom is perfect because the Elegant Themes membership comes with tons of other themes and plugins. If you’re looking for the most comprehensive and powerful WordPress popup and lead generation plugin, then OptinMonster is the best option. Considering the criteria we set in the beginning of this article, we found that OptinMonster is the best WordPress popup plugin in the market. It offers the most bang for your buck considering the features and ease of use. Use our OptinMonster Coupon to get an extra 10% OFF. We hope this article answers the question regarding the best WordPress popup plugin in terms of performance and quality. Which is your favorite WordPress popup plugin? Let us know by sending us a tweet to @wpbeginner on Twitter.